A horrendous-looking crash in the main meeting caused a lengthy delay leaving little time for the MDL match with the curfew looming. However with co-operation from all sides four races were completed and a result achieved. Heat 1 saw the normally-reliable Tom Bacon flip his bike over from the start but thankfully he was soon stomping back across the centre green, more than a little annoyed with himself. The re-run was won comfortably by Layne Cupitt to share the points (3-3) and that set the trend for the remaining races with each one resulting in wins for the Cubs but with the Junior Hitmen packing in for the minor places. 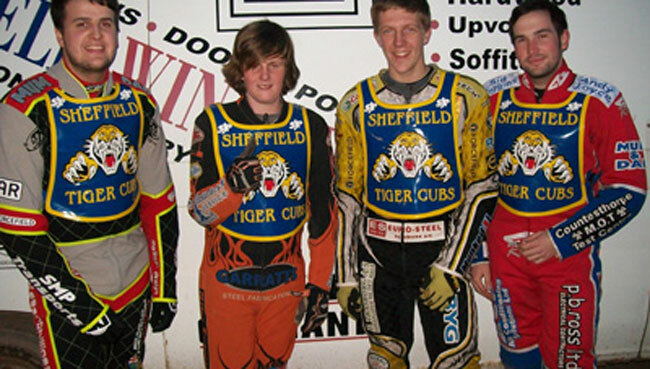 Ben Holloway, in his first meeting for the Cubs since his return from injury, was particularly impressive with two comfortable wins including a rare defeat of Cupitt in Heat 4, and was well supported by the ever-improving Alex Wilson who notched up a win and a second place. Layne Cupitt led the Junior Hitmen from the front with his team-mates all chipping in with vital points to keep the scores level. It's never satisfactory not to complete all six races, and no doubt both teams will believe that they could have clinched victory in the last two races, but, based on the first four heats, a draw was probably a fair result.